Oljira Kenea recently defended his PhD at Addis Ababa University. Kena, O. 2017. Entomological impact of combined and separate use of indoor residual spraying and long-lasting insecticidal nets for malaria prevention in Adami Tullu district, South-Central Ethiopia.PhD thesis. Addis Ababa University. Indoor residual spraying (IRS) and long-lasting insecticidal nets (LLINs) are the key frontline malaria prevention interventions in Ethiopia. Both target Anopheles arabiensis, the sole primary malaria vector. Universal coverage of both interventions has been promoted and there is a growing demand in combination of interventions for malaria control and elimination. However, available evidence is contradictory wether the combined intervention is better than either IRS or LLINs alone. To investigate whether IRS and LLINs combination provides added protective impact on An. arabiensis compared to either IRS or LLINs alone, a cluster randomized controlled trial was carried out in Adami Tullu district, south-central Ethiopia. Villages were randomly allocated to four study arms: IRS+LLINs, IRS, LLINs, and control. All households in the IRS+LLINs and LLINs arms were provided with LLINs (PermaNet 2.0) free of charge. Households in the IRS+LLINs and IRS arms were applied with propoxur before the main malaria transmission season in 2014 and 2015. Adult mosquitoes were collected in randomly selected villages in each arm using CDC light trap catch (LTC) set close to a sleeping person, pyrethrum spray catch (PSC), and artificial pit shelter (PIT), for measuring host-seeking density (HSD), indoor resting density (IRD), and outdoor resting density (ORD) of the anophelines. Human landing catch (HLC) was performed in selected villages to monitor the impact of the interventions on local mosquito biting behaviours (biting location, time and host preference). Collected anophelines were identified to species by use of standard morphological keys and additional use of molecular methods to separate sibling species of the An. gambiae complex. Enzyme-linked immunosorbent assay (ELISA) was used to detect malaria infections in mosquitoes and the sources of mosquito blood meals. Mean densities were compared using incidence rate ratio (IRR) calculated by negative binomial regression. Parity rate (percentage of parous females) was also determined by ovarial dissection. Human blood index (HBI) was expressed as the proportion of mosquitoes with human blood divided by the total number of blood-fed mosquitoes tested. A total of 1786 female anophelines of four species (An. arabiensis, An. pharoensis, An. ziemanni and An. funestus s.l.) were collected over two transmission seasons during the intervention period (2014-2015). Anopheles numbers were highest in the control arm (41.3% of total) followed by LLINs (25.4%), IRS (18.0%), and IRS+LLINs (15.8%). In most of the vector parameters estimated, the impact of IRS and LLINs combined and separate interventions were significantly higher in communities that recieved the interventions (in experimental groups) compared with untreated communities (control group). The mean HSD of An. arabiensis in the IRS+LLINs arm was similar to the IRS arm (0.03 vs. 0.03/ house/LTC/night) but lower than the LLINs arm (0.03 vs. 0.10/house/LTC/night, p=0.07) and so was the difference in IRD and ORD between the IRS+LLINs compared to the IRS arm. However, both IRD and ORD of An. arabiensis were higher in LLINs compared to IRS+LLINs (p < 0.001 for indoors). Parity rate of An. arabiensis were similar among the intervention arms. None of the 1786 samples of four species tested by ELISA was positive for P. falciparum and P. vivax CSP infection in all of the study arms. Anopheles arabiensis preferred mainly bovine and human hosts for blood meal sources with high HBI in the LLIN alone. Indoor resting habit of An. arabiensis was less impacted by LLINs alone intervention compared to IRS + LLINs or IRS alone. In conclusion, the IRS+LLINs and the IRS alone each was similarly most effective against An. arabiensis as compared to the LLINs alone. The IRS+LLINs provided added impact on An. arabiensis compared to LLINs alone. The LLINs alone had poor impact on densities and human biting rates of An. arabiensis in this study setting. Gari T, Kenea O, Loha E, Deressa W, Hailu A, Balkew M, Gebre-Michael T, Robberstad B, Overgaard HJ, Lindtjørn B: Malaria incidence and entomological findings in an area targeted for a cluster-randomized controlled trial to prevent malaria in Ethiopia: results from a pilot study.Malaria Journal 2016, 15. Kenea O, Balkew M, Tekie H, Gebre-Michael T, Deressa W, Loha E, Lindtjørn B, Overgaard HJ: Comparison of two adult mosquito sampling methods with human landing catches in south-central Ethiopia. Malaria Journal 2017, 16. 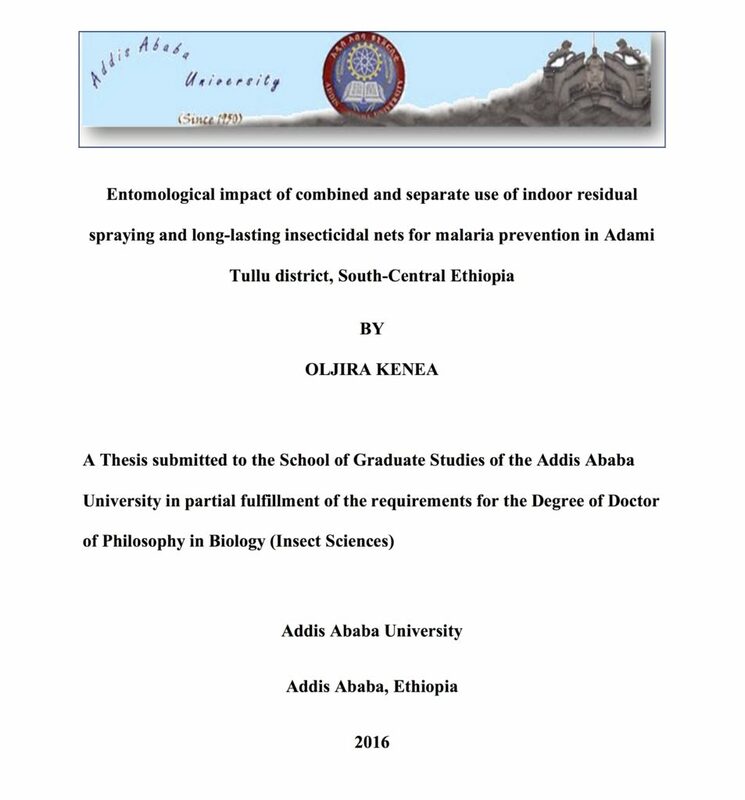 Kenea O, Balkew M, Tekie H, Gebre-Michael T, Deressa W, Loha E, Lindtjorn B, Overgaard HJ: Human-biting activities of Anopheles species in south-central Ethiopia. Parasit Vectors 2016, 9: 527. Kenea O, Balkew M, Tekie H, Gebre-Michael T, Deressa W, Loha E, Lindtjørn B, Overgaard HJ: Comparison of two adult mosquito sampling methods with human landing catches in south-central Ethiopia.Malaria Journal 2017, 16. Background The human landing catch (HLC) is the standard reference method for measuring human exposure to mosquito bites. However, HLC is labour-intensive, exposes collectors to infectious mosquito bites and is subjected to collector bias. These necessitate local calibration and application of alternative methods. This study was undertaken to determine the relative sampling efficiency (RSE) of light traps with or without yeast-produced carbon dioxide bait vs. HLC in south-central Ethiopia. Methods The experiment was conducted for 39 nights in a 3 × 3 Latin square randomized design with Anopheles arabiensis as the target species in the period between July and November 2014 in Edo Kontola village, south-central Ethiopia. Center for Disease Control and Prevention light trap catches (LTC) and yeast-generated carbon dioxide-baited light trap catches (CB-LTC) were each evaluated against HLC. The total nightly mosquito catches for each Anopheles species in either method was compared with HLC by Pearson correlation and simple linear regression analysis on log-transformed [log10(x + 1)] values. To test if the RSE of each alternative method was affected by mosquito density, the ratio of the number of mosquitoes in each method to the number of mosquitoes in HLC was plotted against the average mosquito abundance. Results Overall, 7606 Anopheles females were collected by the three sampling methods. Among these 5228 (68.7%) were Anopheles ziemanni, 1153 (15.2%) An. arabiensis, 883 (11.6%) Anopheles funestus s.l., and 342 (4.5%) Anopheles pharoensis. HLC yielded 3392 (44.6%), CB-LTC 2150 (28.3%), and LTC 2064 (27.1%) Anopheles females. The RSEs of LTC and HLC for An. arabiensis were significantly correlated (p < 0.001) and density independent (p = 0.65). However, for outdoor collection of the same species, RSEs of LTC and CB-LTC were density dependent (p < 0.001). It was estimated that on average, indoor LTC and CB-LTC each caught 0.35 and 0.44 times that of indoor HLC for An. arabiensis respectively. Conclusions Results showed that HLC was the most efficient method for sampling An. arabiensis. LTC can be used for large-scale indoor An. arabiensis surveillance and monitoring when it is difficult to use HLC. CB-LTC does not substantially improve sampling of this major vector compared to LTC in this setting. Gari T, Kenea O, Loha E, Deressa W, Hailu A, Balkew M, Gebre-Michael T, Robberstad B, Overgaard HJ, Lindtjørn B: Malaria incidence and entomological findings in an area targeted for a cluster-randomized controlled trial to prevent malaria in Ethiopia: results from a pilot study. Malaria Journal 2016, 15. Background This study was part of the work to prepare for a cluster-randomized controlled trial to evaluate the effect of combining indoor residual spraying and long-lasting insecticidal nets on malaria incidence. A pilot study was done to estimate the variations of malaria incidence among villages, combined with entomological collections and an assessment of susceptibility to insecticides in malaria vectors. Methods A cohort of 5309 residents from four kebeles (the lowest government administrative unit) in 996 households was followed from August to December 2013 in south-central Ethiopia. Blood samples were collected by a finger prick for a microscopic examination of malaria infections. A multilevel mixed effect model was applied to measure the predictors of malaria episode. Adult mosquitoes were collected using light traps set indoors close to a sleeping person, pyrethrum spray sheet catches and artificial outdoor pit shelters. Enzyme-linked immunosorbent assays were used to detect the sources of mosquito blood meals, while mosquito longevity was estimated based on parity. The World Health Organization’s tube bioassay test was used to assess the insecticide susceptibility status of malaria vectors to pyrethroids and carbamates. Results The average incidence of malaria episode was 4.6 per 10,000 person weeks of observation. The age group from 5 to 14 years (IRR = 2.7; 95 % CI 1.1–6.6) and kebeles near a lake or river (IRR = 14.2, 95 % CI 3.1–64) were significantly associated with malaria episode. Only 271 (27.3 %) of the households owned insecticide-treated nets. Of 232 adult Anophelesmosquitoes collected, Anopheles arabiensis (71.1 %) was the predominant species. The average longevity of An. arabiensiswas 14 days (range: 7–25 human blood index days). The overall human blood index (0.69) for An. arabiensis was higher than the bovine blood index (0.38). Statistically significant differences in Anopheline mosquitoes abundance were observed between the kebeles (P = 0.001). Anopheles arabiensis was susceptible to propoxur, but resistant to pyrethroids. However, An. pharoensis was susceptible to all pyrethroids and carbamates tested. Conclusions This study showed a high variation in malaria incidence and Anopheles between kebeles. The observed susceptibility of the malaria vectors to propoxur warrants using this insecticide for indoor residual spraying, and the results from this study will be used as a baseline for the trial. Kenea O, Balkew M, Tekie H, Gebre-Michael T, Deressa W, Loha E, Lindtjorn B, Overgaard HJ: Human-biting activities of Anopheles species in south-central Ethiopia.Parasit Vectors 2016, 9: 527. Background Indoor residual spraying (IRS) and long-lasting insecticidal nets (LLINs) are the key malaria vector control interventions in Ethiopia. The success of these interventions rely on their efficacy to repel or kill indoor feeding and resting mosquitoes. This study was undertaken to monitor human-biting patterns of Anophelesspecies in south-central Ethiopia. Methods Human-biting patterns of anophelines were monitored for 40 nights in three houses using human landing catches (HLC) both indoors and outdoors between July and November 2014, in Edo Kontola village, south-central Ethiopia. This time coincides with the major malaria transmission season in Ethiopia, which is usually between September and November. Adult mosquitoes were collected from 19:00 to 06:00 h and identified to species. Comparisons of HLC data were done using incidence rate ratio (IRR) calculated by negative binomial regression. The nocturnal biting activities of each Anopheles species was expressed as mean number of mosquitoes landing per person per hour. To assess malaria infections in Anopheles mosquitoes the presence of Plasmodium falciparum and P. vivax circumsporozoite proteins (CSP) were determined by enzyme-linked immunosorbent assay (ELISA). Results Altogether 3,408 adult female anophelines were collected, 2,610 (76.6 %) outdoors and 798 (23.4 %) indoors. Anopheles zeimanni was the predominant species (66.5 %) followed by An. arabiensis (24.8 %), An. pharoensis (6.8 %) and An. funestus (s.l.) (1.8 %). The overall mean anopheline density was 3.3 times higher outdoors than indoors (65.3 vs 19.9/person/night, IRR: 3.3, 95 % CI: 1.1–5.1, P = 0.001). The mean density of An. zeimanni, An. pharoensis and An. funestus (s.l.) collected outdoors was significantly higher than indoors for each species (P < 0.05). However, the mean An. arabiensis density outdoors was similar to that indoors (11.8 vs 9.4/person/night, IRR: 1.3, 95 % CI: 0.8–1.9, P = 0.335). The mean hourly human-biting density of An. arabiensis was greater outdoors than indoors and peaked between 21:00 and 22:00 h. However, An. arabiensis parous population showed high indoor man biting activities during bedtimes (22:00 to 05:00 h) when the local people were indoor and potentially protected by IRS and LLINs. All mosquito samples tested for CSP antigen were found negative to malaria parasites. Conclusions Results show much greater mosquito human-biting activities occurring outdoors than indoors and during early parts of the night, implying higher outdoor malaria transmission potential in the area. However, high bedtime (22:00 to 05:00 h) indoor biting activities of parous An. arabiensis suggest high potential intervention impact of IRS and LLINs on indoor malaria transmission.